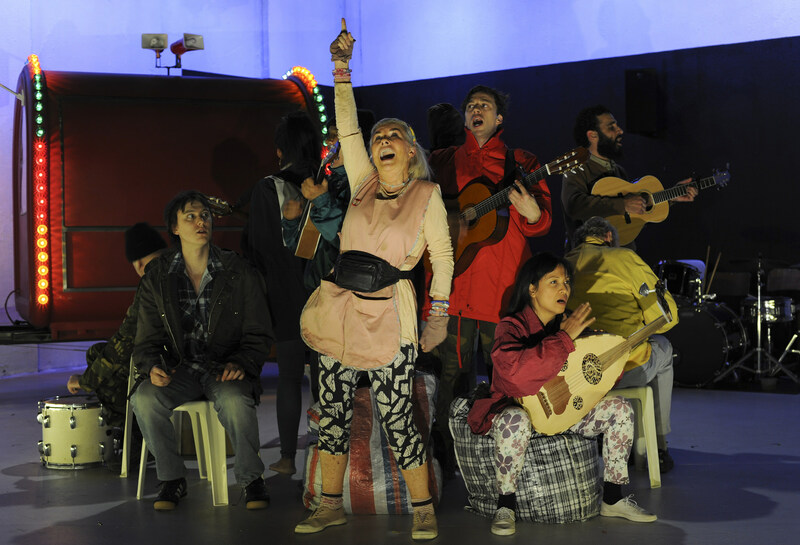 Mother Courage is one of the great theatre roles for women. Physically and emotionally demanding, she is on stage for virtually the entire play as she navigates her profiteering way through the horror of war, losing all three of her children in the process. Robyn Nevin makes the role her own in this exuberant, economically staged Belvoir production directed by incoming artistic director Eamon Flack. Written by Bertolt Brecht in the late 1930s, Mother Courage and her Children was his response to the rise of fascism in Germany and Germany’s invasion of Poland. He set the play during the Thirty Years War (1618 – 1648), a long, arduous, pointless, religious conflict. (Some things never change). A wily refugee called Anna Fierling – or Mother Courage as she is known – follows the troops with her three grown-up children and a cart from which she sells food, liquor and other goods, doing whatever it takes to survive. She is desperate for her children not to become casualties but when the chips are down she is unable to protect them. A rage against war, capitalism and man’s inability to learn from history, it’s a tough play about both the surrender and resilience of humanity during extreme times. Using a sharp new translation by Michael Gow and new music by Stefan Gregory for the songs, Flack’s production bristles with as much vitality as brutality, with snappily choreographed scene changes keeping the action moving. Robert Cousins’s set has a black painted area in the corner resembling a backstage room with props and musical instruments where the actors often sit when not performing: a constant reminder that we are watching theatre being made. Alice Babidge’s contemporary costuming includes military gear and clothes the characters might have got from op shops or the cheapest of stores as they struggle to keep body and soul together. The centerpiece of the design is the cart, which is here bright red with circus-like coloured lights, pictures of hotdogs and other junk food as well as cheap tat like plastic beach thongs. Other than that the stage is bare apart from a few plastic chairs, while firecrackers exploding in a metal bucket help evoke the sounds of war. Flack has mustered an excellent ensemble cast, who play various characters and musical instruments, and each nail their moments. 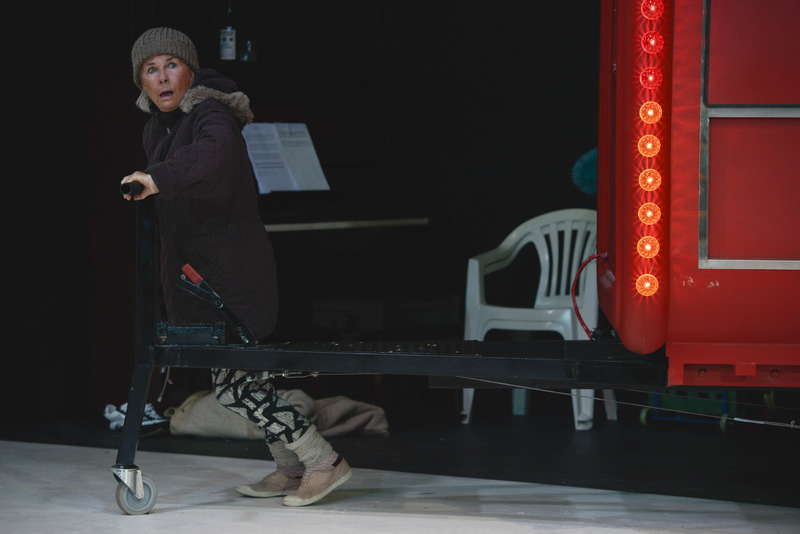 Paula Arundell is gloriously funny as the feisty prostitute Yvette and sings up a storm, delivering the Song of Fraternisation standing on a plastic chair, while newcomer Emele Ugavule is very touching as Mother Courage’s mute daughter Kattrin. Tom Conroy and Richard Pyros are also particularly strong as Mother Courage’s two sons. 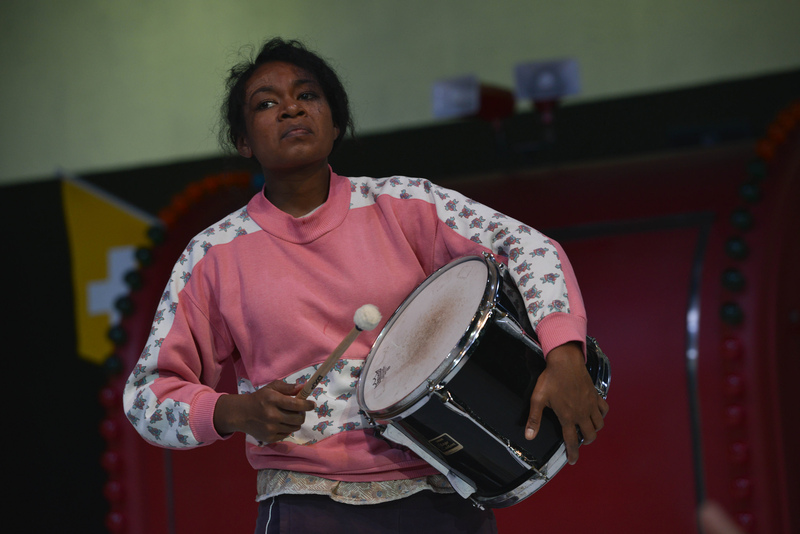 But the production is driven by Nevin’s riveting portrayal of the fast-talking, pragmatic Mother Courage. While the character rarely betrays any emotion, Nevin still manages to convey the tragedy that envelops and batters her, as well as her wicked sense of humour. We glimpse emotions flit across her face only to be immediately concealed; we see her body droop just a tiny bit then steel itself. Though she’s no singer or dancer, she also throws herself into both with endearing gusto, touchingly reinforcing the fact that Mother Courage will do whatever it takes. Then there are the brief flashes of tenderness that strike at the heart. The way she spoons soup into her daughter’s mouth like a mother bird ­– an unspoken vow that she won’t desert her child – is an unforgettably poignant moment. The famous, final image of her pulling her cart alone, having lost all her children, hits hard as the lights snap off. This entry was posted in Theatre and tagged Alice Babidge, Eamon Flack, Emele Ugavule, Michael Gow, Paula Arundell, Richard Pyros, Robert Cousins, Robyn Nevin, Stefan Gregory, Tom Conroy by jolitson. Bookmark the permalink.